Mullah Akhtar Mohammad Mansour was the emir (leader) of the Afghan Taliban from July 2015 to May 2016 before being killed May 21 by a U.S. airstrike. Mansour rose to emir following the announcement of the death of the Taliban’s former emir, Mullah Mohammed Omar, on July 30, 2015.Adam Withnall, “Taliban appoints Mullah Omar's deputy Akhtar Mohammad Mansour as its new Afghan leader,” Independent (London), July 30, 2015, http://www.independent.co.uk/news/world/middle-east/taliban-appoints-mullah-omars-deputy-akhtar-mohammad-mansour-as-its-new-afghan-leader-10427082.html. 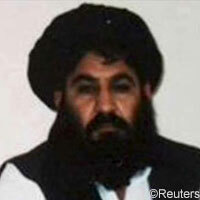 Mansour’s appointment to the leadership position came amid an internal power struggle between top Taliban leaders, a number of whom backed Omar’s eldest son, Mullah Mohammad Yaqoob, as the successor.Rahimullah Yusufzai, “Amid uncertainty over Mulla Omar’s fate....Power struggle flares up in Afghan Taliban movement,” News International (Karachi), July 27, 2015, http://www.thenews.com.pk/Todays-News-13-38799-Amid-uncertainty-over-Mulla-Omars-fatePower-struggle-flares-up-in-Afghan-Taliban-movement. During his time as leader of the Afghan Taliban, Mansour operated out of Pakistan, and repeatedly rejected peace talks with the Afghan government.Gardiner Harris, “Obama Confirms Death of Mullah Mansour, Taliban Leader, in U.S. Strike,” New York Times, May 23, 2016, http://www.nytimes.com/2016/05/24/world/asia/obama-mullah-mansour-taliban-killed.html. President Obama, in announcing Mansour’s death, called Mansour a danger to American forces and attributed the deaths of “countless innocent Afghan men, women and children” to the deceased Taliban emir.Gardiner Harris, “Obama Confirms Death of Mullah Mansour, Taliban Leader, in U.S. Strike,” New York Times, May 23, 2016, http://www.nytimes.com/2016/05/24/world/asia/obama-mullah-mansour-taliban-killed.html. Like much of the Taliban leadership, little was publicly known about Mansour during his lifetime. He had been described as a “strong and chubby” drug trafficker who had recruited Taliban members and planned attacks in Afghan city centers.“Mansoor, Mullah Akhtar Mohammed,” Afghan-bios.info, last modified March 20, 2015, http://www.afghan-bios.info/index.php?option=com_afghanbios&id=1017&task=view&total=3136&start=1643&Itemid=2; “TI.M.11.01. AKHTAR MOHAMMAD MANSOUR SHAH MOHAMMED,” United Nations Security Council, accessed June 3, 2015, http://www.un.org/sc/committees/1988/NSTI01101E.shtml. Mansour hailed from the influential Ishaqzai clan of the Durrani tribe of Pashtuns in Kandahar province. He suspended his religious training during the Soviet occupation of Afghanistan to join the mujahedeen.M Ilyas Khan, “Profile: Taliban leader Mullah Akhtar Mansour,” BBC News, May 22, 2016, http://www.bbc.com/news/world-asia-34405035. Mansour had reportedly controlled the coordination and placement of suicide bombers in these attacks.“Mansoor, Mullah Akhtar Mohammed,” Afghan-bios.info, last modified March 20, 2015, http://www.afghan-bios.info/index.php?option=com_afghanbios&id=1017&task=view&total=3136&start=1643&Itemid=2. During the Taliban’s rule of Afghanistan (1996-2001), Mansour was the minister of civil aviation and transportation.“The Taliban,” Council on Foreign Relations, accessed April 13, 2015, http://www.cfr.org/terrorist-organizations-and-networks/taliban/p35985?cid=marketing_use-taliban_infoguide-012115#!/; Bill Roggio, “The Afghan Taliban’s top leaders,”Long War Journal, February 23, 2010, http://www.longwarjournal.org/archives/2010/02/the_talibans_top_lea.php. International media outlets circulated Mansour’s name in November 2010 when an impostor pretending to be Mansour met with Afghan officials for secret talks. The man reportedly traveled from Pakistan on a NATO aircraft and had three meetings with government officials.Dexter Filkins and Carlotta Gall, “Taliban Leader in Secret Talks Was an Impostor,” New York Times, November 22, 2010, http://www.nytimes.com/2010/11/23/world/asia/23kabul.html. An anonymous Western diplomat in Kabul told media outlets: “It’s not him. And we gave him a lot of money.”“Taliban impostor ‘dupes Afghans and vanishes with cash’,” BBC News, November 23, 2010, http://www.bbc.com/news/world-south-asia-11818583. Mansour was killed in southwestern Pakistan, in the country’s Baluchistan province. He was killed while driving in his car, according to Afghanistan’s Chief Executive Abdullah Abdullah.Cassandra Vinograd, Fazul Rahim, and Mushtaq Yusufzai, “Afghanistan: Taliban Leader Mullah Akhtar Mansoor Is Dead,” NBC News, May 23, 2016, http://www.nbcnews.com/news/world/afghanistan-taliban-chief-mullah-akhtar-mansoor-dead-n578211. Shah Mohammed Akhtar Mohammad Mansour Akhtar Mohammad MansoorDexter Filkins and Carlotta Gall, “Taliban Leader in Secret Talks Was an Impostor,” New York Times, November 22, 2010, http://www.nytimes.com/2010/11/23/world/asia/23kabul.html; Abubakar Siddique, “The Quetta Shura: Understanding the Afghan Taliban's Leadership,” The Jamestown Foundation, February 21, 2014, http://www.jamestown.org/programs/tm/single/?tx_ttnews%5Btt_news%5D=42006&cHash=7af7678306a23ff6734f35e261b15b90#.VW8Bac9Viko; “TI.M.11.01. AKHTAR MOHAMMAD MANSOUR SHAH MOHAMMED,” United Nations Security Council, accessed June 3, 2015, http://www.un.org/sc/committees/1988/NSTI01101E.shtml; “Mansoor, Mullah Akhtar Mohammed,” Afghan-bios.info, last modified March 20, 2015, http://www.afghan-bios.info/index.php?option=com_afghanbios&id=1017&task=view&total=3136&start=1643&Itemid=2.